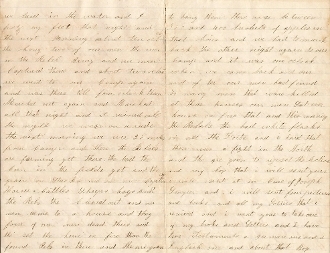 Soldier's Letter, 4 pages, 8vo., "December 22nd AD 1864". Henry Gruver (Co. E, 207th Pennsylvania Infantry) writes to his father. "...I will let you know that it was very cold this morning and on the ninth we had to march after dresperat (dress parade) about six o'clock half a mile from Camp and lay there that night and it was very cold and hailed all the night and I guess it snowed hear that night and I and Henry Fishel carried brushes together and made our bed on it and the next morning we laid in the water and I froze my feet that night and the next morning about ten o'clock they hung two of our men that were in the Rebel Army and our men captured them and about two o'clock we went to our Camp again and was there till four o'clock & then marched and again and marched all that night. We were on a road the next morning. We were 25 miles from camp and there the Rebels are farming yet. There they had the corn in the fields yet and the grain on stacks and our men captured horses cattles sheeps hogs and the Rebs they cleared out and our men came to a house and they four of our men dead there and they set the house on fire then they found Rebs in there and are going to hang them. There was between 350 and 400 bushels of apples in that house and we had to march back the other night again to our Camp and it was one o'clock when we came back and after our men had found so many men that were killed at those houses our men sat every house on fire that and this morning the rebels they had white flags on all the Forts and I heard that there was a fight in the North...Direct your letters to Henry Gruver, Co. E 207th reg. Pa in care of Capt. Small Ninth Army Corps Washington DC"
Fine. Comes with the original cover, stamp removed.